In September, the House Natural R e s o u r c e s Committee adopted Rep. Mike Johnson’s (LA-04) amendment to H.R. 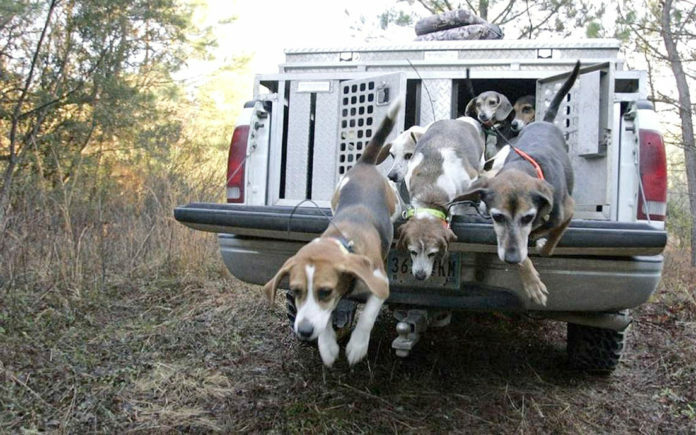 3668, the SHARE Act, to allow deer hunters to hunt with their dogs in the Kisatchie National Forest located in Louisiana’s Fourth District. This amendment prohibits the National Forest Service from discriminating against different kinds of hunting and returns authority back to the state wildlife agencies. The Sportsmen’s Heritage and Recreational E n h a n c e m e n t (SHARE) Act, was introduced Sept. 1 by Congressman Jeff Duncan (R-SC). Following the subcommittee hearing, the full Committee on Natural Resources passed the SHARE Act by a vote of 22-13. This year’s version of the SHARE Act is the most expansive and far-reaching yet. Besides previously introduced provisions aimed at enhancing opportunities for hunting, fishing and shooting and broadening access to federal lands for these purposes, this year’s SHARE Act contains reforms that would widely benefit sportsmen and the gun-owning public at large. It would allow gun owners to transport registered firearms across state lines, carry guns in national parks and eliminate the $200 transfer tax on silencers. Congress has been unable, or unwilling, to approve gun control legislation after recent mass shootings — including one targeting lawmakers playing baseball — and it is unlikely to consider new bills after the attack in Las Vegas. The SHARE Act now heads to the House Floor.